Members of Cub Scout Pack 553's Cobra Patrol delivered boxes full of batteries for recycling to the Metal Conversion Technology plant in Cartersville, Georgia. The WEBELOS have been collecting all types of batteries for recycling as a service project and delivered them to the plant where they were treated to a pizza party and tour of the facility. Disposing of batteries in a landfill can cause the casing to be crushed and degrade which can release mercury and other toxins into the enviornment. The WEBELOS intend to continue collecting and recycling batteries as scouts and good citizens to help protect our enviornment and reuse our resources. If you would like to recycle your batteries, you can contact WEBELOS Leader Sheilia Thurmon, thurmons@bellsouth.net, or start your own battery recycling program by contacting Metal Conversions Technology. Pack 846 on a recent trip to Stone Mountain. Cub Scout Pack 846 hosted a Recruit Night on Thursday, August 27 at 7:00 p.m. in the Parsons Elementary School cafeteria. At Recruit Night, parents can meet the Pack Leaders, ask questions and learn more about the scouting program. Sophie Bennett is in Troop 1840 Junior Girl Scouts and was awarded the Bronze award on May 19, 2009. Starting in scouts as a Daisy, Brownies for 3 years, and then on to Junior Girl Scouts, Sophie has earned 43 of the Junior Scouts Badges, the Junior Aide Award, and the Leadership pin. She did community service and Gwinnett Rehabilation center during weekends and evening helping the elderly and reading and singing to them. Sophie also put in a total of 21 hours in community service by cleaning the entrance to a neighborhood, planting flowers, picking up litter along the road. She helped with the younger Brownie Troop 1048 and taught them scout songs, safety and attended their meetings to tell them about the Bronze Award. She completed all the Signs that are required to earn the Bronze Award- Sign of the Rainbow, Star, Sun and World. In addition to all of this Sophie as well as the others in the troop earned an Olympic patch given this year in regards to the 2008 Olympics in China - this was earned thru WAGGS. Apalachee District, Northeast Georgia Council, is pleased to announce that John Elvis Kral earned the rank of Eagle Scout on March 28, 2009. John is the son of John and Maria Kral, Buford, and a member of Troop 594 chartered by Calvary Chapel. He completed his Eagle Scout Leadership Service Project by designing, planning and supervising the formation of a 28 foot retaining wall at Calvary Chapel. This wall will help with an on-going erosion problem that other methods have failed to control. John led a team of volunteers consisting of Boy Scouts, Venturing Scouts and American Heritage Girls in this project that cost $350 and took approximately 139 hours to complete. The purpose of the Eagle Project is to demonstrate leadership and benefit the community. 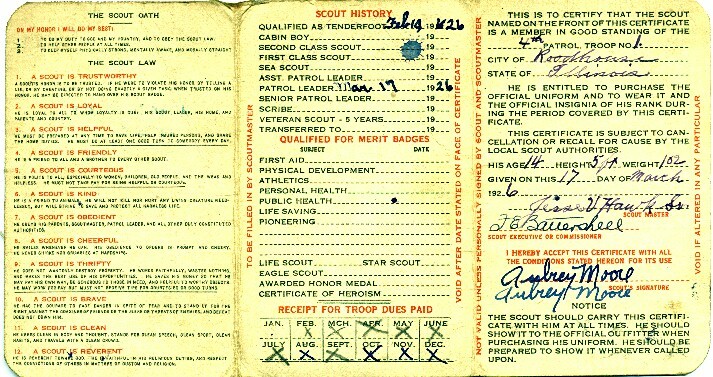 John earned 25 merit badges, including the 21 merit badges required for the rank of Eagle Scout. He has served his troop as Senior Patrol Leader and Instructor. John just completed ninth grade and is home-schooled. He wishes to thank his parents and all the many adult volunteers who have helped in along his 9 year scouting career, which began as a Tiger Cub Scout in the first grade. Apalachee District, Northeast Georgia Council, is pleased to announce that Aaron Christopher Penn earned the rank of Eagle Scout on December 20, 2008. Aaron is the son of Scott and Nancy Penn, Buford, and a member of Troop 503 chartered by Trinity Christian Fellowship Church. His Eagle Court of Honor was June 13, 2009. He completed his Eagle Scout Leadership Service Project by planning and providing leadership to a landscaping project on an undeveloped parcel of land belonging to Trinity Christian Fellowship Church. Volunteers planted several sections of shrubs and plants on this parcel, which runs parallel to the entrance. Private donations in excess of $500 funded the project, with family, friends, Scouts and leaders providing over 150 hours of labor. Aaron’s project added tremendous aesthetic value to the church. The purpose of the Eagle Project is to demonstrate leadership and benefit the community. Aaron earned 39 merit badges, including the 21 merit badges required for the rank of Eagle Scout. He has served his troop as Patrol Leader, Assistant Patrol Leader and Troop Guide. Aaron has been a boy scout for twelve years during which, among other things, he has served by volunteering at soup kitchens, helping in the construction of an outdoor classroom and assisting in the construction of a workroom and shed for The New Hope Center, an organization serving individuals with developmental disabilities. In addition to Boy Scouts, Aaron is a senior at Mill Creek High School where he has a 3.7 overall GPA, is a National Merit Scholarship qualifier, a member of the National Honor Society, Mu Alpha Theta (a National Math Honor Society) and the National Spanish Honor Society. Through the Beta Club and the Interact/Rotary Club, Aaron has been active in service to the community helping with local Food and clothing drives for Food Banks, with Red Cross Blood drives and Relay for Life events. He also volunteers through Mu Alpha Theta as a math tutor at the high school. Aaron will be attending the University of Georgia in the fall. Apalachee District, Northeast Georgia Council, is pleased to announce that Tyler Christian Veronee earned the rank of Eagle Scout on December 20, 2008. Tyler is the son of Laura Veronee, Lawrenceville, and a member of Troop 56, chartered by Lawrenceville First United Methodist Church. He is also a member of Venture Crew 73. He completed his Eagle Scout Leadership Service Project by leading a group of volunteers in the construction and delivery of lap desks to the Veteran Administration Hospital in Decatur. The lap desks will be used by the nursing home residents at the VA. The purpose of the Eagle Project is to demonstrate leadership and benefit the community. Tyler earned 26 merit badges, including the 21 merit badges required for the rank of Eagle Scout. He has served his troop as Senior Patrol Leader, Assistant Senior Patrol Leader, Patrol Leader, and Chaplain Aid. He first joined the scouting program as a Tiger Cub in 1999 and has earned 2 Religious Medals. He continues to be active in scouting and is a Brotherhood member of Mowogo Lodge, Order of the Arrow. Tyler is a sophomore at Collins Hill High School. Elden Morris, Finance Officer of Post and Squadron 264, was Devin's Troop Committee Chairman and sat on his Board of Review, the committee that reviews a Boy Scout's qualifications to become an Eagle Scout. He is also the 5th District Scouting Committee Chairman and a Commissioner in the Covered Bridge District. 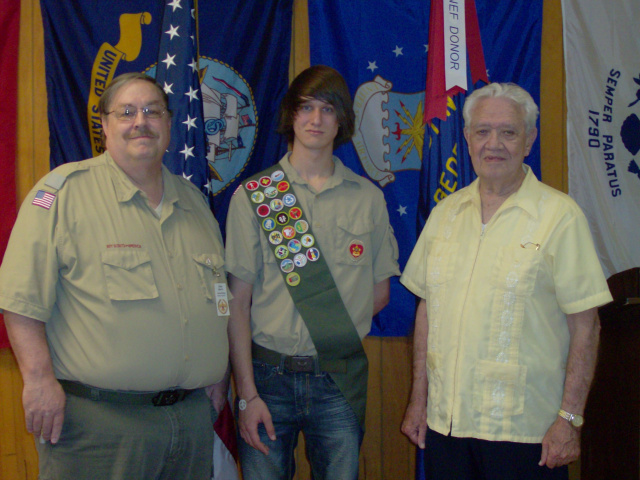 Sons of the American Legion Squadron 264 Member, Devin Stepp, 18, earned his Eagle Scout Rank on March 16. 2012. Devin is a senior at Center Acadamy in Smyrna and belongs to Troop 749 of the Covered Bridge District, Atlanta Area Council in Mableton. Devin has been in scouting since he was six years old. He plans to study Psychology. His Eagle Scout Project was to build and install Blue Bird Houses on the nature trail at the Presbyterian Village assisted living home. Elden Morris, Finance Officer of Post and Squadron 264, was Devin's Troop Committee Chairman and sat on his Board of Review, the committee that reviews a Boy Scout's qualifications to become an Eagle Scout. He is also a Unit Commissioner in the Covered Bridge District. Scouting in Georgia has a long history, from the 1910s to the present day, serving thousands of youth in programs that suit the environment in which they live. 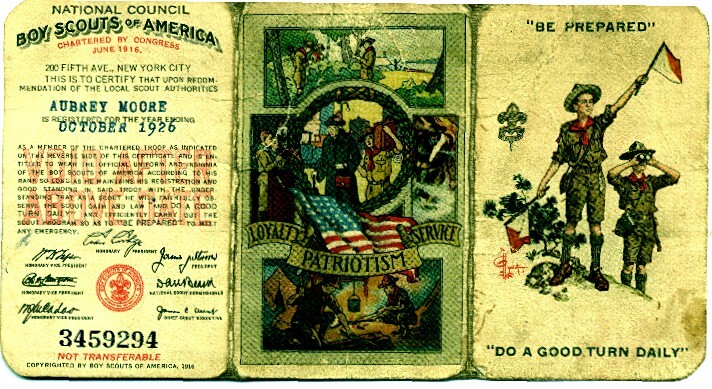 The state is home to many milestones for the Scouting movement. The Girl Scout Birthplace is located in Savannah, and President Jimmy Carter served as a Scoutmaster in Plains. There are thirteen active Boy Scouts of America local councils that serve Scouts in Georgia. Active councils are listed below. Milton A. Caniff - comic strip artist "Steve Canyon"
William E. Dannemeyer - US Rep from Cal. Gerald Ford - U.S. President (1st Eagle to be pres. ), "Junior" Ford of Troop 15, Grand Rapids, MI in 1927, 26 MBs--including Civics, "Boy Scouts was invaluable in shaping my life." J. Willard Marriott, Jr. - Pres. Marriott Corp.
Wallace Stegner - writer and college professor, won Pulitzer Prize in 1972 for "Angle of Repose"
Percy Sutton - Attorney, Ch. of Board of City Broadcasting Corp.
0.5% of the male population. Harrison Ford - Life, taught Reptile Study, actor "Indiana Jones"
Bill Gates - Life, founder of Microsoft Corp.
Click on each Badge title below for Badge photo and full description.